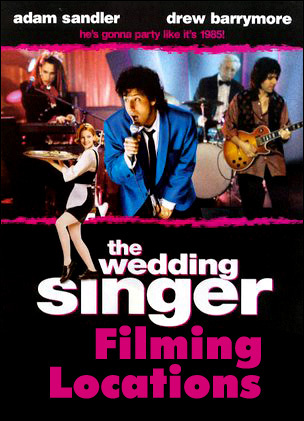 1998 Adam Sandler comedy, "The Wedding Singer", was filmed. 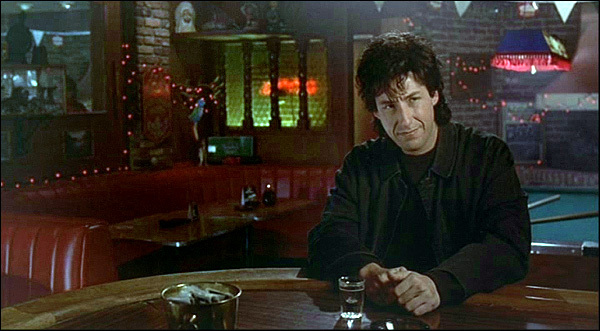 In the film, wedding singer Robbie (Adam Sandler) lives in his sister's basement. 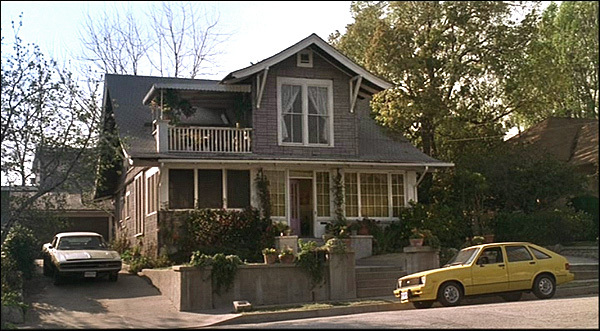 You'll find Robbie's sister's house at 1075 E. Topeka Street, in Pasadena, CA. 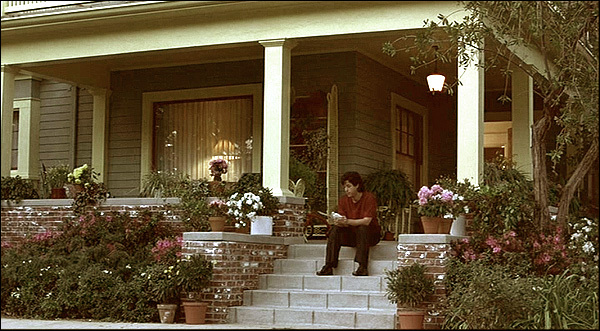 It's on the north side of the street, in the north part of Pasadena (up near Altadena). 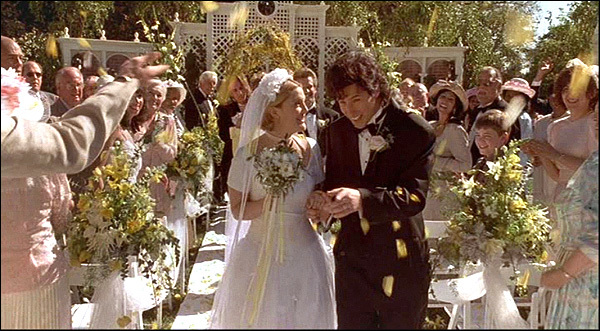 Robbie falls for Julia (Drew Barrymore), despite the fact that both of them are engaged to other people. 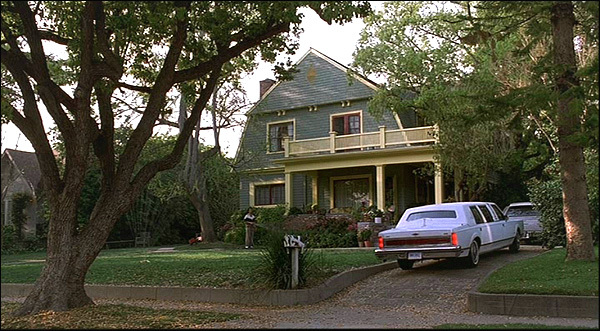 You'll find Julia's house at 43 Sierra Place, in Sierra Madre, CA. It's on the west side of the street, just south of Sierra Madre Blvd. The Huntington Library & Gardens, at 1151 Oxford Road, in San Marino, CA. 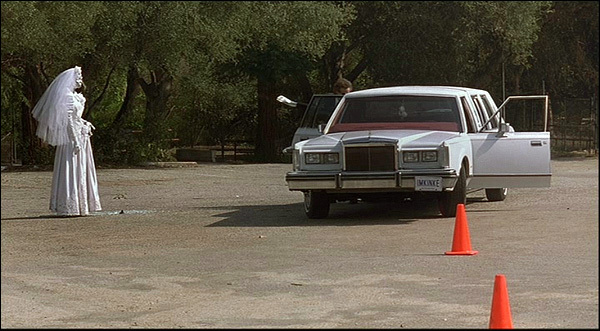 The Huntington is located just south of Pasadena, on what was once the private estate of a land baron. That grassy mall (statues and all) is located just west of the Library and just north of the Art Museum. 1425 N. Orange Grove Ave, in West Hollywood, CA. just over a mile east of Grauman's Chinese Theatre. 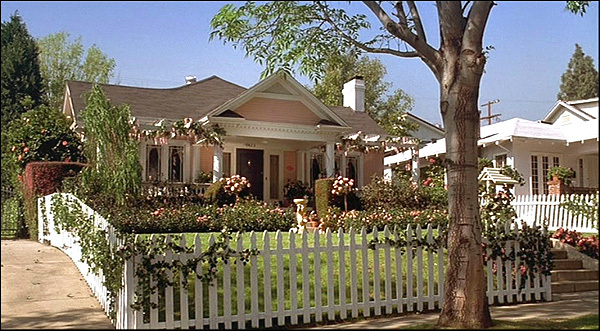 Don't expect to see the white picket fence and roses - they were added by the producers. (Thanks to Owen for this one. He, in turn, got it from Lindsay of iamnotastalker.com). Descanso Gardens - 1418 Descanso Drive, La Canada/Flintridge, CA. (Thanks to Owen, and Lindsay of iamnotastalker.com). 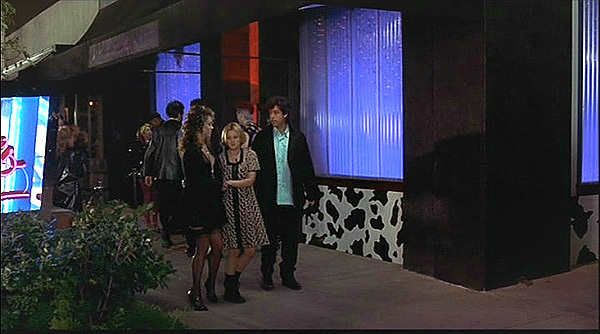 Robbie & Julia, Glen & Holly have a double date at a club named Spanky's. That exterior was really the Black Cow Cafe - 2219 Honolulu Ave, in Montrose, CA. Montrose is a small town northeast of Glendale, and just west of Descanso Gardens. 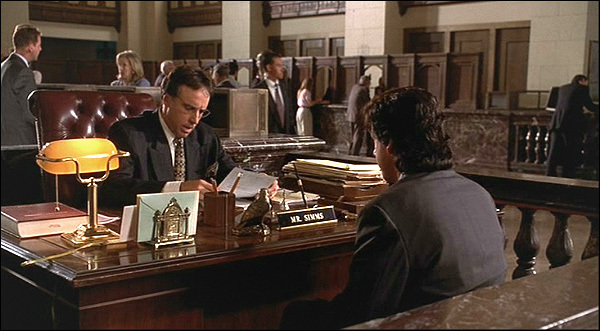 Hoping to make more money to impress his fiancé, Robbie goes to a job interview at a bank. 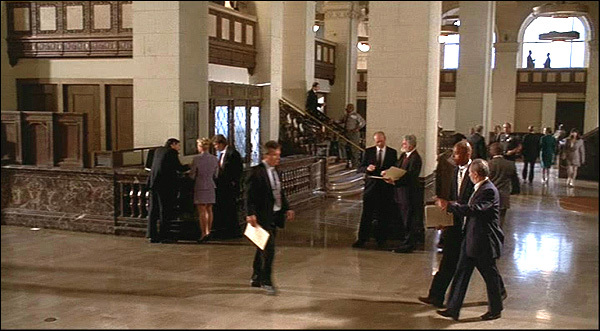 at 650 S. Spring Street, in downtown Los Angeles. 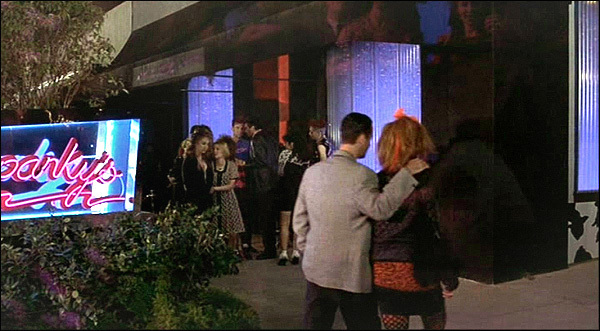 That's on the east side of Spring St, just north of 7th St.
including "Seven", "The Mask", "St. Elmo's Fire" and "24". 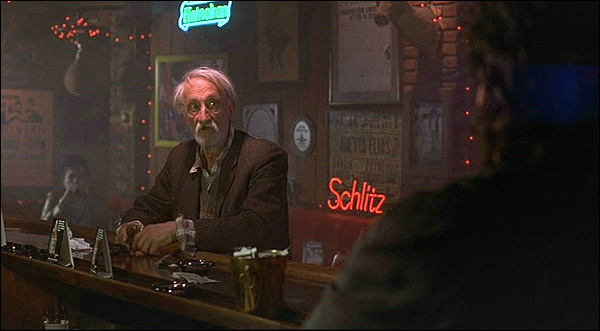 Avignone's bar, at 2321 Honolulu Ave, in Montrose, CA. It's on the north side of the street, just a few blocks east of Spanky's. The Huntington Library & Gardens - 1151 Oxford Road, San Marino, CA. 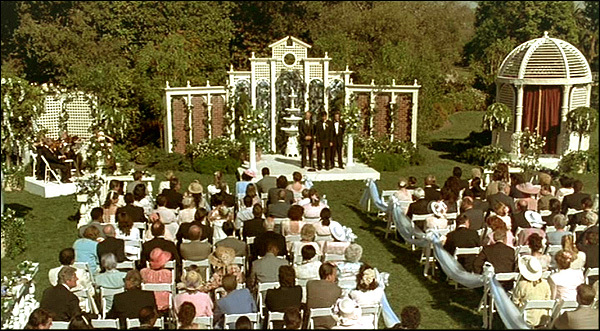 the same estate where they filmed that earlier wedding scene.. 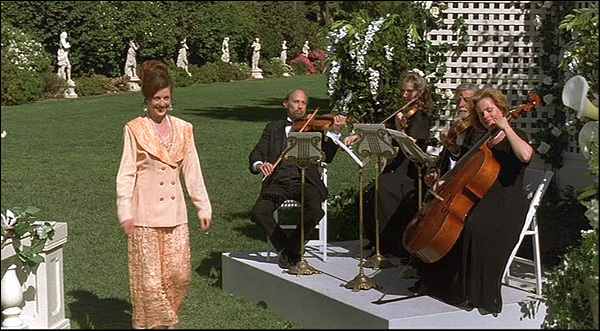 The photos on this page are stills from the DVD of "The Wedding Singer"
(which you can buy by clicking here) and are copyright New Line.